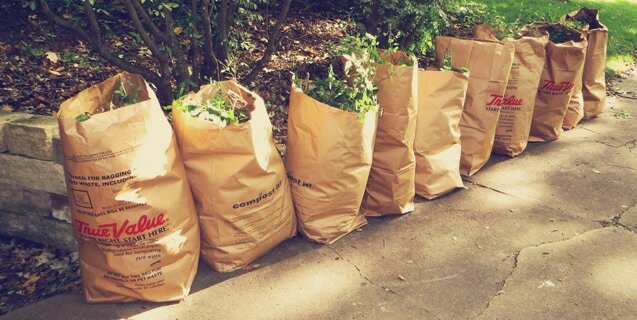 Toronto Yard Waste - What you need to know! As springtime rolls around, yard work becomes less and less avoidable. But as the weather gets nicer, it becomes pleasant and rewarding to work outside and get your yard cleaned up. And with the excellent Toronto yard waste collection services, getting rid of yard waste such as tree branches, leaves, weeds, etc. is a breeze. In 2014, normal springtime yard work has been intensified by the need to clean up after the terrible ice storm that devastated many areas of Toronto and the surrounding area. When cleaning up tree branches and limbs, keep in mind that the city of Toronto has specific rules regarding tree limbs and stumps. The city will collect branches of up to 7.5 cm (3 inches) in diameter. Anything larger than that must be broken down into smaller pieces, or collected by a private company who specializes in yard waste removal. Also, keep in mind that grass clippings and sod are no longer collected by the City of Toronto. The city encourages you to leave grass clippings on your lawn to act as a fertilizer. In order to keep the system running smoothly, it’s important to follow the various by laws concerning yard waste collection. The first step in complying with these by laws is to consult the collection calendar, found here. To stay compliant, yard waste should be stored in approved yard waste containers only. You can use rigid open toped containers, such as garbage cans, or you can use Kraft paper bags. Do not use plastic bags or cardboard boxes. Yard waste should be stored on your own property until the night before collection. The city encourages you to put the yard waste out on the curb no earlier than 8pm the night before the scheduled collection. These by laws apply to all residents of Toronto, even those employing private companies to collect their yard waste. It is the responsibility of the citizen to ensure their collection agency stays compliant with city by laws. Follow these rules and help keep the system running smoothly. Repeated failure to follow city by laws may result in fines. Once you memorize the calendar and get into the rhythm of things, it quickly becomes habit. Thank you for helping to keep Toronto a beautiful place to live!